The third day of fighting at the Battle of Gettysburg, July 3, 1863, consisted of Culp's Hill, Cemetery Ridge, and two cavalry battles: one approximately three miles to the east, known as East Cavalry Field, and the other southwest of Big Round Top mountain on South Cavalry Field. While infantry fighting resumed on the morning of July 3, 1863, Union cavalry under Gen. David McMurtrie Gregg were strongly picketing the intersection of the Hanover and Low Dutch roads–the direct route to the rear of the Union Center with two brigades, with a third, the Michigan cavalry of Gen. George Custer, close at hand. Artillery shells signaled the opening of Confederate attack followed by dismounted fighting on the farm of John Rummell. The Confederate horsemen under Gen. Jeb Stuart launched a series of mounted attacks, each of which was repulsed by a mounted charge from the Federals. After suffering heavy losses, Stuart withdrew his forces. The Union rear was secure. 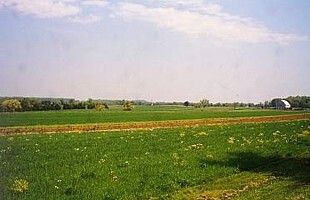 (Right) Picture of East Cavalry Field from the Union artillery positions near the Hanover Road. Rummel Woods and the Rummel Farm is in the distance to the left. Gettysburg NMP. Elements of the two armies collided west and north of the town on July 1, 1863. Union cavalry under Brig. Gen. John Buford slowed the Confederate advance until Union infantry, the Union 1st and 11th Corps, arrived. More Confederate reinforcements under generals A.P. 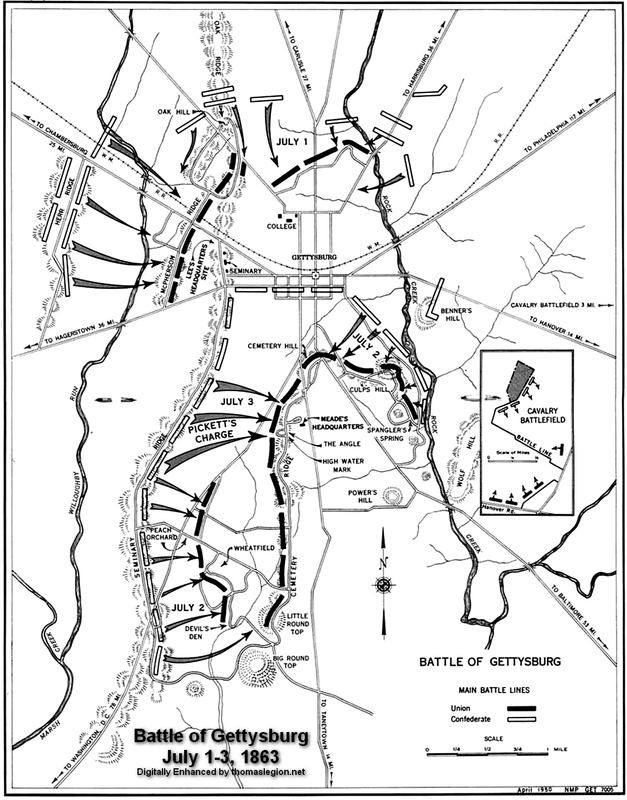 Hill and Richard Ewell reached the scene, however, and 30,000 Confederates ultimately defeated 20,000 Federals, who fell back through Gettysburg to the hills (Cemetery Hill and Culp's Hill) south of town. Field of cavalry operations east of Gettysburg, July 2nd & 3rd 1863. (About) Field of cavalry operations east of Gettysburg, July 2nd & 3rd 1863. Map of the country east of Gettysburg, showing the location of cavalry engagements by crossed swords, positions of the 3rd and 16th Pennsylvania cavalry, roads, houses and names of residents, vegetation, and relief by hachures. Julius Bien (1826-1909). Library of Congress. 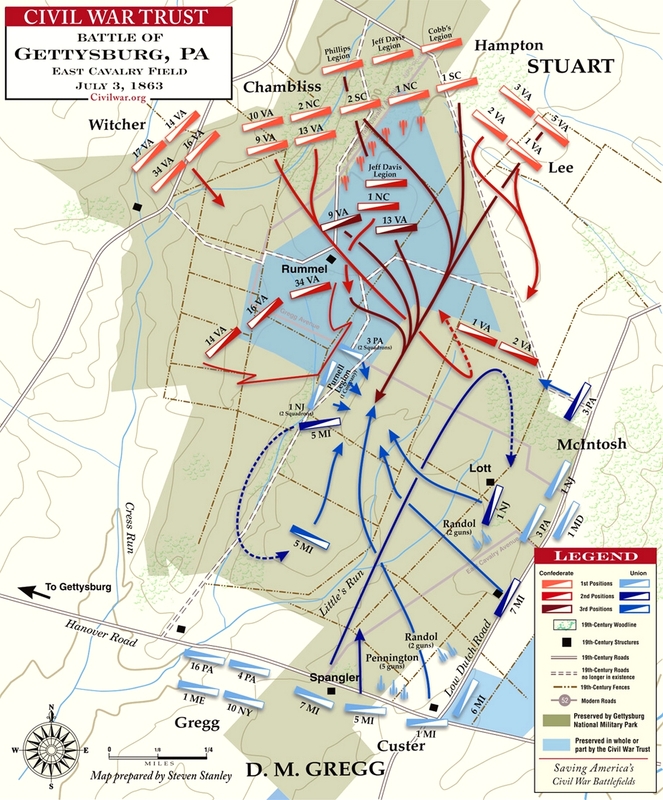 On July 3, fighting resumed on Culp's Hill, and cavalry battles raged to the east and south, but the main event was a dramatic infantry assault by 12,000 Confederates, known as Pickett's Charge, against the center of the Union line on Cemetery Ridge. While Confederate artillery pounded Cemetery Ridge near Gettysburg on July 3, another drama was unfolding three miles to the east. Union and Confederate cavalry (American Civil War Cavalry Organization) had skirmished east of Gettysburg the day prior, and Union scouts on the Hanover Road were alert to any troop movements in that direction. (Right) Photo of the Rummel Farm from the Confederate artillery positions. Stuart directed his attack from this vicinity, against Union troops to the south. Gettysburg NMP. The situation appeared quiet enough to allow some Union troopers to be ordered back to the Gettysburg battlefield. Just as the troops were about to depart, scouts spotted a cloud of dust to the north that appeared to get closer every minute. The tramp of hundreds of horse hooves and the rumble of artillery made the Northerners realize that trouble was indeed headed their way. It was trouble! General J.E.B. Stuart's Cavalry Division was ordered by General Lee to ride east and then south in an attempt to get into the rear of the Army of the Potomac, to disrupt and possibly cut the Union lines of communication. Anxious to prove himself after an embarrassing confrontation with the army commander, General Stuart set out that morning to ride around the Union flank and make amends, taking it out on the Yankee army the only way he knew how: show up where the Union troops least expected him. A true cavalier in every sense of the word, General Stuart was one of the more flamboyant horsemen in either army. Following closely behind his advance scouts, Stuart led his horsemen down unfamiliar county roads and farm lanes until they came upon a thick wood at the Rummel Farm. 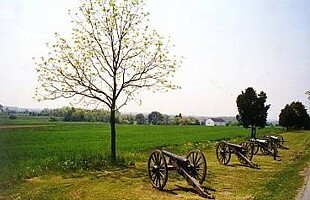 South of his position, General Stuart spotted Union artillery being unlimbered on a small knoll. Beyond the artillery rose clouds of dust and Stuart quickly realized that he had been spotted. Ordering his artillery forward, Stuart decided to use Rummel's Woods to protect his troopers until he could determine the size of the force in his front. Meanwhile, he deployed dismounted troopers into the Rummel Farm to engage Union skirmishers already posted behind fences. Union scouts watched as Stuart's columns rode into position and deployed in the fields around the Rummel buildings. Brig. General David McMurtie Gregg's troops had been posted on the Hanover Road until 1 P.M. when they were ordered to march to a location south of Gettysburg. Gregg was in the act of withdrawing his troops when Stuart's horsemen arrived. Gregg immediately countermanded the orders and deployed his artillery and dismounted troopers into the fields near the intersection of the Hanover Road and Low Dutch Road. Immediately a brisk fire opened between opponents. Hoping to press his advantage of surprise, General Stuart ordered his artillery to suppress the fire of the Union guns while he aligned his troops to push aside the apparently weak Union troops. But the Union response was extraordinarily accurate and the Northern artillery began to knock out the Confederate gun crews one by one. Union cavalry charge at Gettysburg. Battles and Leaders. Gregg Cavalry Monument at Gettysburg. Gettysburg NMP. Fighting on foot, the cavalrymen of both sides dueled in the fields of the Rummel Farm with neither side gaining any advantage. Growing frustrated at his attempts to brush aside the Union troopers, General Stuart ordered his soldiers to go forward in a mounted attack. Yet every appearance of his Confederates in the open fields was met with cannon fire and by a Union counter charge. Among Gregg's troops east of Gettysburg that afternoon was the Michigan Brigade commanded by a brash young officer named George Armstrong Custer. Custer was a newly appointed brigadier general of volunteers and Gettysburg was his first experience in command of troops in battle. Dressed in a personally designed new uniform, the fiery young officer led his troopers through the fighting and was notable for being in the forefront of the repeated Union charges over the Rummel Farm. 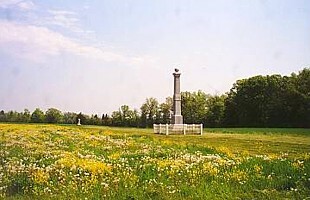 (Left) Photo of the Gregg Cavalry Shaft Monument. It was here where Stuart's column and the 1st Michigan Cavalry violently collided on July 3. Gettysburg NMP. With time running out and ammunition running low among some his troopers, General Stuart wagered that one last charge using most of his force would overwhelm the Union line and hopefully scatter what appeared to be a thinly held crossroad. All of his brigades rode into the field in front of Rummel Woods, their sabers and carbines glistening in the hazy sunlight. With the command, "Battalions, forward!" the southern horsemen moved off toward the smoking Union position. Almost immediately, Union artillery turned their guns on the massed columns, explosions striking down man and animal alike. Seeing the gray column coming toward them, General Custer excitedly rode to the head of the 1st Michigan Cavalry. With the cry, "Come on, you Wolverines! ", he spurred his horse directly toward the Confederate charge and the Union horsemen followed with sabers flashing in the afternoon sun. The Michigan soldiers drove headlong into Stuart's determined troopers. In the melee that followed, the soldiers shot, slashed, and stabbed each other at close range. 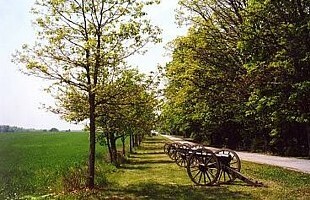 (Right) Picture of Stuart's artillery positions on Confederate Avenue in Rummel Woods. Gettysburg NMP. Suddenly, a Federal force appeared on the flank of the Confederates. 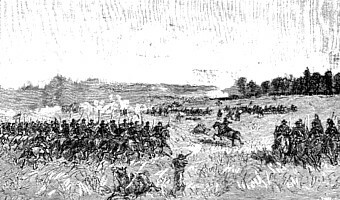 A battalion of Union troopers from the 3rd Pennsylvania Cavalry commanded by Captain William E. Miller, broke from the cover of a tree line and charged headlong into the southern rear. 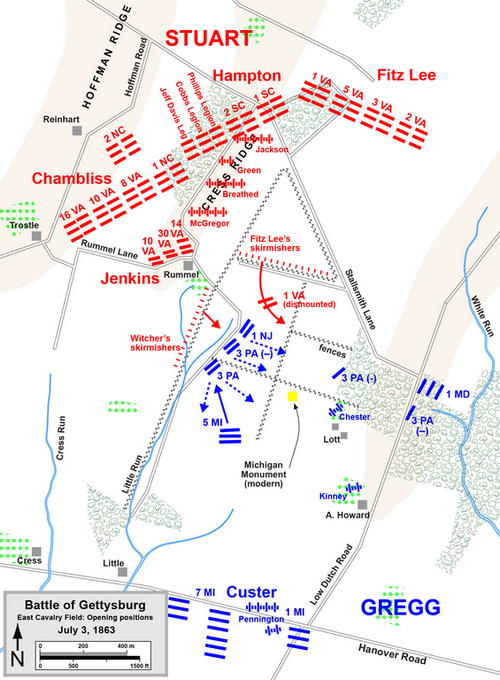 Attacked from three sides and nearly surrounded, there was nothing left for the southerners to do but retreat. Watching the dismal results of the charge from Rummel Woods, General Stuart ordered his cavalry to leave the field to the battered but victorious Union cavalry. The South's greatest cavalry leader had finally met his match. George Armstrong Custer was hailed as a national hero for his exploits and courage under fire during the Civil War. He was conspicuous during the Battle of Gettysburg and during the pursuit of Lee to the Potomac River. By the following year, the young officer had risen to the rank of major general and was in command of a cavalry division that he led through the 1864 campaign in Virginia's Shenandoah Valley. Custer loved the attention heaped on him by his superiors and his exploits made for good press in northern newspapers and War Department reports. His quest for glory and personality may have been a bit brash to some, but his performance as a cavalry officer was superb. Custer commanded his division through the final campaign of 1865 in the pursuit of Lee's army to Appomattox Court House, and it was where his apparent arrogance led to an unceremonious encounter with General Longstreet just prior to the surrender. General Custer had the honor of riding at the head of his troops in the Grand Review in Washington in May 1865, where he received the accolades of countless admirers. Custer returned to the regular army after the war and reverted to a lower rank than he had held as a leader of volunteers. He was ordered to frontier posts in the west where he was assigned to command a portion of the 7th United States Cavalry. In the often brutal campaigns against the plains Indians, Lt. Colonel Custer found a cunning and deceptive enemy that he had difficulty understanding and fighting. Controversy surrounding claims over the Black Hills of South Dakota and Montana caused an uprising of the nations in 1876 and a US Army force, including the 7th Cavalry, was sent in pursuit of the combined tribes, resulting in a number of pitched battles. On June 25, 1876, Custer and most of the men who followed him were killed at the Battle of the Little Big Horn in Montana. General Custer's remains were recovered from the battlefield for burial at West Point. General Custer's foe at Gettysburg, General James Ewell Brown ("J.E.B.") Stuart, did not fare well after the close of the Gettysburg Campaign. Highly criticized for his absence from the army when General Lee needed his scouting abilities, Stuart made a concerted effort to recover his fame and remove this stain from his honor. He led and was successful in several small raids on Union supply lines in Virginia that fall. 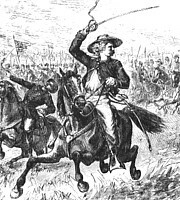 The following year, Stuart's horsemen were ordered to pursue a Union cavalry force headed toward Richmond. Gen. Stuart (left) and Gen. Custer (above) are numbered among the elite cavalrymen of the war. Blocking the Union advance at Yellow Tavern on May 11, 1864, Stuart was mortally wounded while attempting to capture a small group of stray Union troopers. He died the following day. General Stuart is buried in Hollywood Cemetery in Richmond, Virginia, where his famous hat and saber are preserved at the Museum of the Confederacy. Of all cavalry officers who served during the American Civil War, JEB Stuart will always be identified and remembered as "the last great cavalier". At about 11 a.m. on July 3, Stuart reached Cress Ridge, just north of what is now called East Cavalry Field, and signaled Lee that he was in position by ordering the firing of four guns, one in each direction of the compass. This was a foolish error because he also alerted Gregg to his presence. The brigades of McIntosh and Custer were positioned to block Stuart. As the Confederates approached, Gregg engaged them with an artillery duel, and the superior skills of the Union horse artillerymen got the better of Stuart's guns. Stuart's plan had been to pin down McIntosh's and Custer's skirmishers around the Rummel farm and swing over Cress Ridge, around the left flank of the defenders, but the Federal skirmish line pushed back tenaciously; the troopers from the 5th Michigan Cavalry were armed with Spencer repeating rifles, multiplying their firepower. Stuart decided on a direct cavalry charge to break their resistance. He ordered an assault by the 1st Virginia Cavalry, his own old regiment, now in Fitz Lee's brigade. The battle started in earnest at approximately 1 p.m., at the same time that Col. Edward Porter Alexander's Confederate artillery barrage opened up on Cemetery Ridge. Fitz Lee's troopers came pouring through the farm of John Rummel, scattering the Union skirmish line. Gregg ordered Custer to counterattack with the 7th Michigan. Custer personally led the regiment, shouting "Come on, you Wolverines!" Waves of horsemen collided in furious fighting along the fence line on Rummel's farm. Seven hundred men fought at point-blank range across the fence with carbines, pistols, and sabers. Custer's horse was shot out from under him, and he commandeered a bugler's horse. Eventually enough of Custer's men were amassed to break down the fence, and they caused the Virginians to retreat. 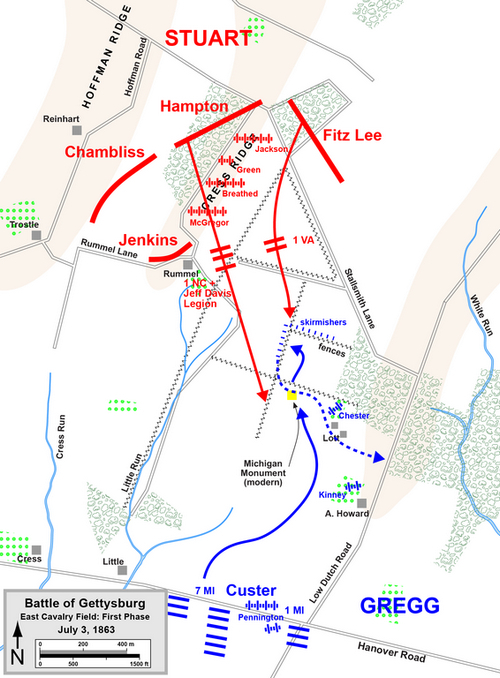 Stuart sent in reinforcements from all three of his brigades: the 9th and 13th Virginia (Chambliss's Brigade), the 1st North Carolina and Jeff Davis Legion (Hampton's), and squadrons from the 2nd Virginia (Lee's). 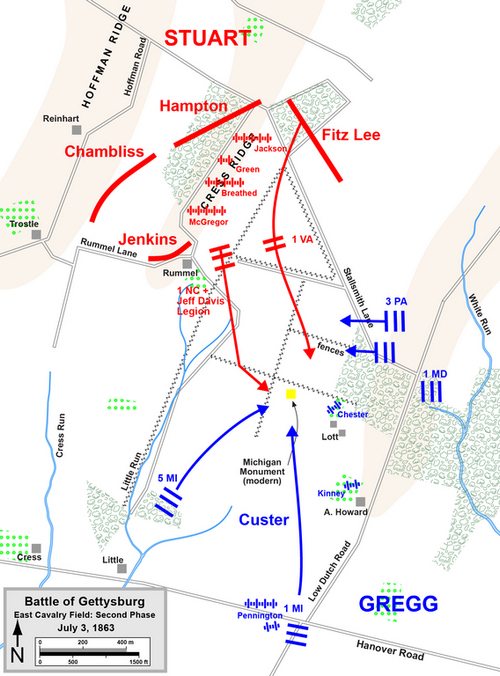 Custer's pursuit was broken, and the 7th Michigan fell back in a disorderly retreat. The losses from the 40 intense minutes of fighting on East Cavalry Field were relatively minor: 254 Union casualties, 219 of them from Custer's brigade; 181 Confederate. Although tactically inconclusive, the battle was a strategic loss for Stuart and Robert E. Lee, whose plans to drive into the Union rear were foiled. 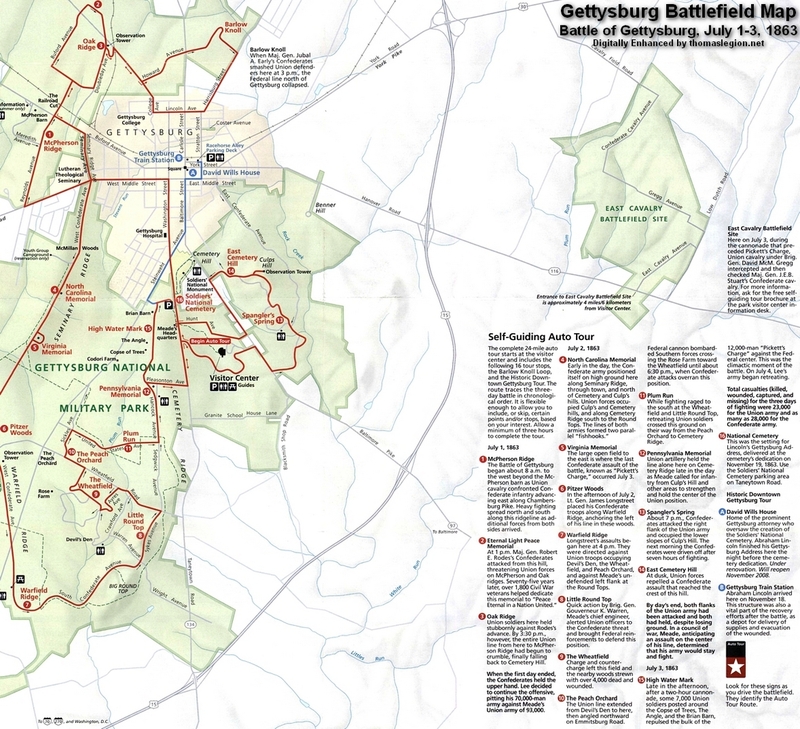 Sources: Gettysburg National Military Park; National Archives; Official Records of the Union and Confederate Armies; Library of Congress; Hal Jespersen, cwmaps.com; Civil War Trust, civilwar.org. 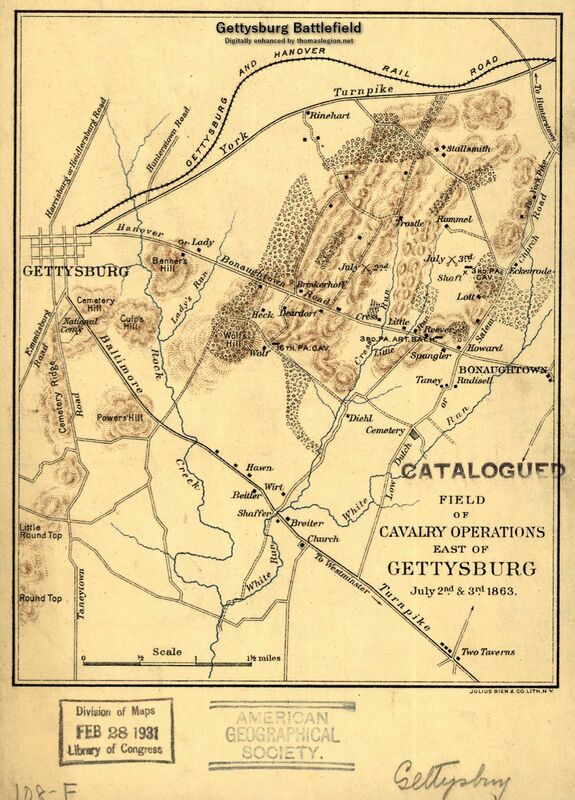 Recommended Reading: Protecting the Flanks: The Battles for Brinkerhoff's Ridge and East Cavalry Field, Battle of Gettysburg, July 2-3, 1863 (Discovering Civil War America). Description: Award-winning historian Eric J. Wittenberg has written a comprehensive study of the critical actions on Brinkerhoff's Ridge and East Cavalry Field, fought on July 2 and 3, 1863. In these actions, Union Brig. Gen. David M. Gregg's Second Cavalry Division fought two protracted and important actions along the Union right flank. The fight for Brinkerhoff's Ridge, although relatively small in numbers, prevented the legendary Stonewall Brigade from participating in the Confederate assaults on Culp's Hill, perhaps tipping the balance in the struggle for the hill. Continued below. Wittenberg presents a new and controversial theory for why Maj. Gen. JEB Stuart's Confederate cavalry appeared on Cress Ridge on East Cavalry Field on the afternoon of July 3, 1863. After a long and bloody dismounted fight, Brig. Gen. George Armstrong Custer's Michigan Cavalry Brigade helped to repulse a massed mounted charge by three brigades of Southern horsemen, securing the Union right flank, and helping to clinch the Northern victory at Gettysburg. Wittenberg weaves the stories of soldiers together with a keen understanding of the terrain and presents a compelling story that features six fine maps by John C. Heiser and forty illustrations. The book also includes a driving tour guide of the Brinkerhoff's Ridge and East Cavalry Field battlefields that includes an additional twenty photographs of modern-day views of these sites. This book is a must for all Gettysburg and cavalry buffs. About the Author: Eric J. Wittenberg is a native of southeastern Pennsylvania. He has spent much of his adult life studying cavalry operations in the Gettysburg Campaign. His first book, "Gettysburg's Forgotten Cavalry Actions," won the third annual Bachelder-Coddington Literary Award as the best new work interpreting the Battle of Gettysburg in 1998. In addition, he has written numerous books and articles. Eric was educated at Dickinson College and the University of Pittsburgh School of Law. He is an attorney in private practice. Eric, wife Susan, and their three golden retrievers live in Columbus, Ohio. The last few chapters deal directly with the "historiography" of Stuart's ride--and very professionally I might add. Clear distinction is made between the authors’ opinions and the secondary sources. In the end, the authors don't play their hand early with regard to conclusions. Facts are presented and different interpretations offered, then the authors make their conclusions. Interesting and very well written. Recommended Reading: The Cavalry at Gettysburg: A Tactical Study of Mounted Operations during the Civil War's Pivotal Campaign, 9 June-14 July 1863. Description: For cavalry and/or Gettysburg enthusiasts, this book is a must; for other Civil War buffs, it possesses the qualities sought by students of the conflict. It bristles with analysis, details, judgements, personality profiles, and evaluations and combat descriptions, even down to the squadron and company levels. The mounted operations of the campaign from organizational, strategic, and tactical viewpoints are examined thoroughly. Continued below. Recommended Reading: Nathan Bedford Forrest: In Search of the Enigma (Hardcover: 528 pages). Description: Nathan Bedford Forrest’s astounding military abilities, passionate temperament, and tactical ingenuity on the battlefield have earned the respect of Civil War scholars and military leaders alike. He was a man who stirred the most extreme emotions among his followers and his enemies, and his name continues to inspire controversy. In this comprehensive biography, Forrest is properly illuminated as the brilliant battlefield tactician--and the only Confederate cavalry leader feared by Gen. Ulysses S. Grant. Historians Eddy W. Davison and Daniel Foxx offer a detailed explanation of the Fort Pillow "Massacre" unraveling the facts to prove that it was not indeed a massacre. The book also discusses Forrest’s role in the Ku Klux Klan and how he came to be its first grand wizard. Continued below.